The Armed Forces Day is being observed on Tuesday with due solemnity and enthusiasm marking the establishment of Bangladesh military during the Liberation War. On this day in 1971, Bangladesh Armed Forces comprising army, navy and air force came into being and launched an all-out attack on the Pakistani occupation forces. Since the country's independence, the day has been observed as the Armed Forces Day every year. 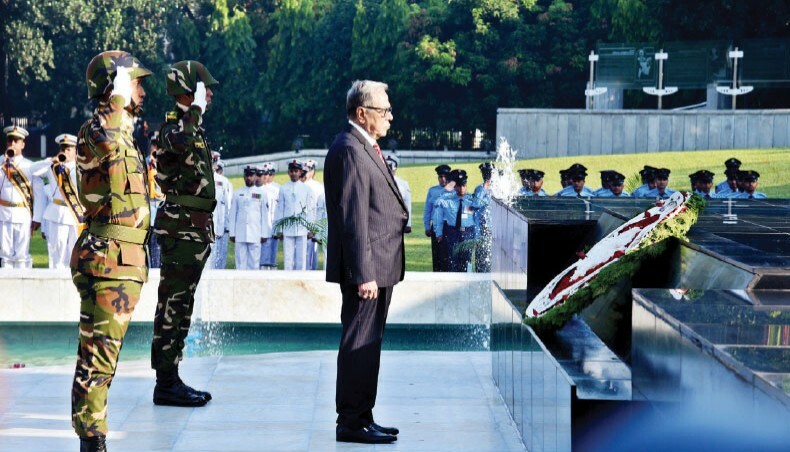 President Md Abdul Hamid paid tribute to ‘Shikha Anirban’ or eternal flame at Dhaka Cantonment on Tuesday morning. The President, who is also the Supreme Commander of Armed Forces, placed wreath at the altar of Shikha Anirban (eternal flame) at 8 am and stood there in solemn silence for a while as a mark of respect to memories of the martyrs. Later, a smartly turned out contingent of the Army, the Navy and the Air Force presented a salute on the occasion. President Hamid also signed the visitors' book there. Earlier, on his arrival at Shikha Anirban, chiefs of the three services and the principal staff officer of the Armed Forces Division received the President. He was followed by Prime Minister Sheikh Hasina who holds the defence ministry. She placed a floral wreath before the flame for honouring the nation’s martyrs. Both were greeted by the heads of army, air force and navy and the principal staff officer of the Armed Forces Division. The day's programmes started with the offering of special prayers in mosques of all cantonments, naval and air force outposts after Fazr prayers, seeking divine blessings for the country's welfare and progress and continued development and progress of the Armed Forces. President Abdul Hamid, also the supreme commander of the Armed Forces, and Prime Minister Sheikh Hasina issued messages on the occasion. The president in his message yesterday said, “Independence is our great achievement, to make it more meaningful we should continue our efforts. The government has formulated "Forces Goal-2030" for the development of the Armed Forces." He expressed his strong belief that the Armed Forces members would continue their efforts to uphold their honour through hard labour, sincerity and patriotism. The PM said Bangabandhu Sheikh Mujibur Rahman had set up Bangladesh Military Academy, Combined Arms School and training schools for each military core. “Our government has been continuously working for modernisation of the Armed Forces,” she added. The chiefs of the three services will pay courtesy calls on the president at the Bangabhaban and the PM at the Armed Forces Division at Dhaka Cantonment.